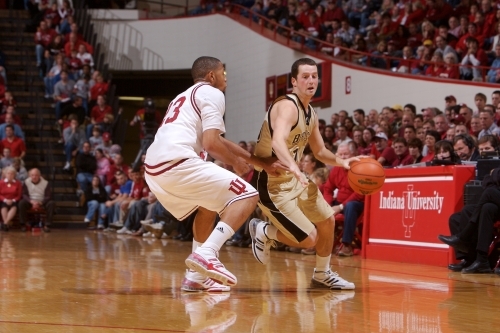 John Keimig, who graduated from MHS in 2004, brings the ball upcourt for UNC-Pembroke against Indiana University at famed Assembly Hall during the 2007-08 college basketball season. Applying defensive pressure is IU's Eric Gordon, who averaged 16 points a game during his rookie year in the NBA with the Los Angeles Clippers in 2008-09. Since Ron Engle became the Knights' head coach 50 years ago, 33 Middletown High players have gone on to play college basketball.